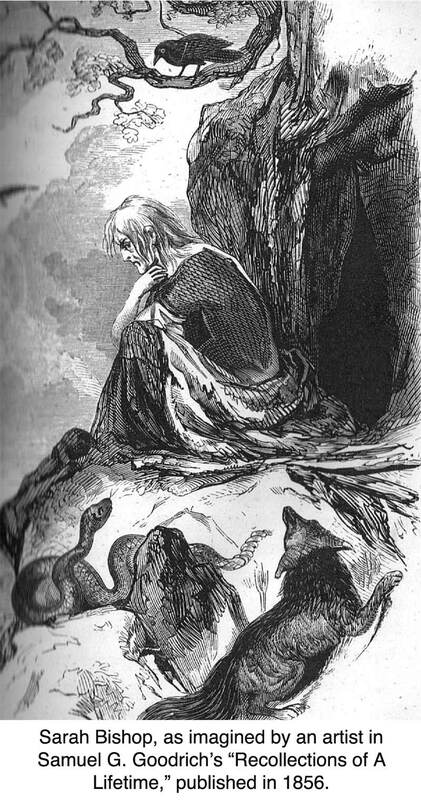 Ridgefield has had not only a hermit, but also a hermitess—though, officially, she was a New Yorker. Sarah Bishop lived in a tiny cave in the side of West Mountain in Lewisboro, N.Y., just across the Ridgefield line westward of Oreneca Road and Sturges Park. She arrived during the Revolutionary War, but no one knows why. Several legends explain her appearance. One said she was in love with a sea captain who deserted her. Another maintained that shortly before her wedding day, British troops invaded her Long Island home and a Redcoat raped her. Full of shame or sorrow, she ran away to this cave from which, on a clear day, she could see Long Island and the place where she spent her girlhood days. 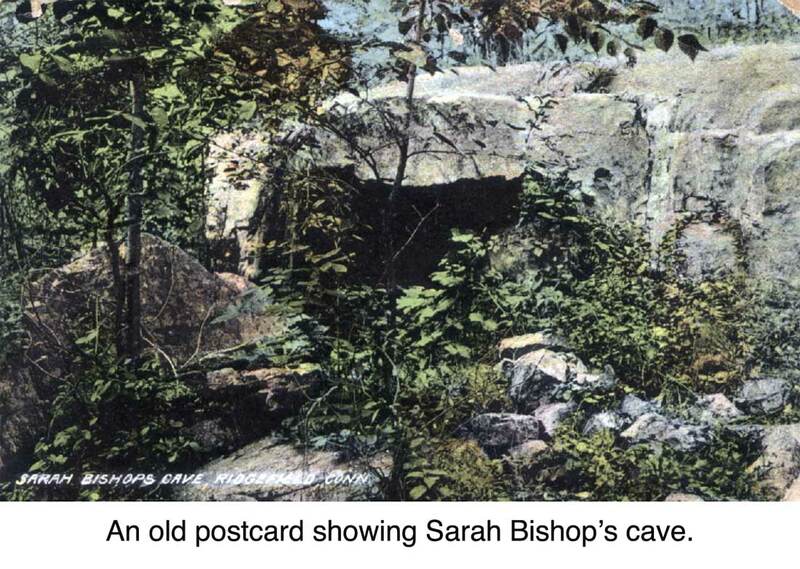 Sarah Bishop lived on gifts of food, on wild plants, and on a small garden she kept near her cave, which was little more than a hollow in some rocks. A reporter who visited her in 1804 said a few peach trees, as well as beans, cucumbers and potatoes grew in a nearby clearing. There were also said to be many grape vines nearby. She also got some necessities from kind-hearted people on West Mountain and in Ridgefield and South Salem, whose villages she periodically visited. villages, seldom being absent more than one or two days at a time. She never begged, but received such articles as were given to her. “She was of a highly religious turn of mind, and at long intervals came to our church and partook of the sacrament. She sometimes visited our family—the only one thus favored in town—and occasionally remained over night. She never would eat with us at the table, nor engage in general conversation. Sarah Bishop died in 1810. According to George L. Rockwell, “the generally accepted story is that one stormy night, she left the house of one of the neighbors, who lived on the corner of the road leading up to the mountain. Wending her way up the steep mountainside to her cave, she fell, and too weak to continue her way, perished from the cold. She was found among the rocks a short distance from her cave.” She was buried in an unmarked grave in North Salem. In 1908, Dr. Maurice Enright, a physician who maintained a summer place here, wrote a novel, “The Ridgefield Tavern, A Romance of Sarah Bishop, Hermitess, During the American Revolution.” The book cast Sarah Bishop as the daughter of the operator of the Keeler Tavern (“Ridgefield Tavern”), a photograph of which appears in the book. The account is, of course, fictional. Goodrich turned to poetry to capture the color of the old hermitess, publishing the following in 1823 under his pen name of Peter Parley, in a Hartford newspaper. It’s a great piece to read aloud on Halloween night. where the eagle bore its plunder. From the forest wild and gray. Yet no sorrow or sympathy shed. You had said ‘Twere a ghost that pass’d. And swept by vengeful gale. And the rattlesnake coil in her lap. As to fan her long locks with his wing. And slept without bed in her rock. And talk’d with the troubled dead. She told to the walls of her cell!